Dependency and entitlement: whose head stuck in the sand? The 47% video has highlighted a sharp difference in worldview between conservatives and advocates of fairness/social justice. The deep outrage we’ve seen within the latter group suggests an unwillingness to accept that entitlement and dependency are real phenomena stemming from human experience. Just as with Mr. Obama’s “You didn’t build that” snippet, we could get lost in parsing what Mr. Romney meant. But the stakes are different here. If Mr. Obama is culpable for his quote, it is more a matter of worldview than of character. But if Mr. Romney is guilty in the way sensationalists claim, then we must believe that he has a shriveled heart that is little more than a black lump of coal. This is just absurd given his sacrifices and dedication to family, church, and country. So we can and ought to dismiss this cartoon version of Romney. The real question is not whether all of the 47% feel entitled and are dependent, but whether anyone in the group could be characterized as such. Of course no one really thinks grandma or a worker retired on disability suffer from a sense of entitlement. But this is precisely the interpretation mainstream journalists have been running with all week. Such a hard prosecution is one half an insidious double standard. On the one hand, the commentariat is completely okay suggesting that affluent Mr. Romney is out of touch, doesn’t care or relate to everyday struggles, or even that he wants to “pull the ladder up” behind him. On the other hand, it’s utterly unthinkable to suggest that even one poor or working class person might be beholden to entitlement or dependency. Per the dictates of political correctness, to do so would be an unconditional surrender to the worst bias and stigma. This rule cannot persist. Lest we go the way of Greece, our public discourse must accommodate some way of talking about these very real problems. Rich, poor, and middle class folks are created equal in a real sense. Across the dividing lines, all have intuition and faculties of reason. The discipline of economics operates on the assumption that we are all rational creatures, agents who, whether consciously or not, respond to incentive. We couldn’t escape it even if we tried. Yet, big government politicians and guilt-ridden journalists would rather ditch this common sense understanding of humanity for the comfortable materialist fantasy that they took up at university and never quite abandoned. There are all sorts of ways to describe the perils of incentive that effect the wide umbrella of welfare and entitlement transfers the federal government offers: rent seeking, moral hazard, tragedy of the commons, crowding out, rising expectations. People’s behavior changes in response to conditions. The sputtering, moribund economies of many European social democracies attest to what happens when workers secure the right to too generous a menu of entitlements. Those who have seized on the 47% comments have highlighted a dangerous state of denial in our country. 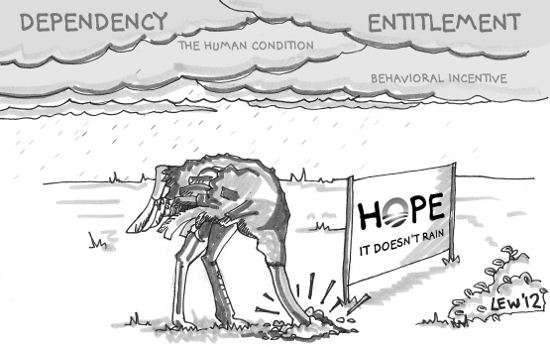 Dependency and entitlement are heavy clouds that threaten to burst cultural and economic disaster on us. The way some react to these words though make it seem as if their heads are stuck in the sand. 4 Responses to Dependency and entitlement: whose head stuck in the sand? Your post is insightful and thought provoking. Those that do not understand the nature of man offer solutions that are well meaning but lead to more problems rather than solutions. Well written and great observations. Personally, I think the MSM simply latches onto the smallest seed of “Gotcha” on any Republican and magnify the sunlight on it hoping it sprouts. The question is, does Mr Romney believe what Cogitating Duck (and I and most conservatives believe, namely, that there is a dependency problem but that it is nowhere near 47%), so he was just being lazy in his formulation and telling self-satisfied rich people what they want to hear — (which is what he normally does, just tells people what he thinks they want to hear), or does he believe what he said? In the best case, he was just being lazy and/or opportunistic in his formulation, as I assume he was in his comments on the British Olympics, and after the murder of our people in Libya. He’s the only candidate we have so we have to go with him, sadly. But it would be nice, next time, to have a candidate who had a well-thought-out, principled position on the issue of the welfare state and foreign policy. Leave complete opposition to Social Security and Medicare and similar measures to the Libertarians. Cogitating Duck, I wish I could write as eloquently as you. Excellent post.